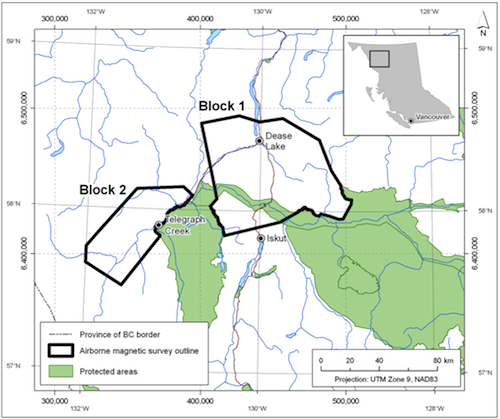 Geoscience BC is pleased to issue this Request for Proposals (RFP) for two airborne magnetic surveys, to be flown as part of the QUEST-Northwest Project. The QUEST-Northwest Project is designed to stimulate new mineral exploration activity in the northwest part of the Province, and to enhance the success of existing exploration activities in the region. The QUEST-Northwest project will include three types of activities: airborne magnetic surveys (two separate blocks), a regional geochemical program, and geological mapping. This project has been designed to develop a better understanding of the mineral potential of the area. Geoscience BC is now seeking proponents to undertake two separate airborne magnetic geophysical surveys, one between Dease Lake and Iskut (Block 1), and one west of Telegraph Creek (Block 2). Proponents must submit separate proposals for Block 1 and Block 2. Proposals should be submitted by e-mail no later than 12 pm (Pacific) on June 13, 2011. All questions and communication should be directed to Christa Sluggett, Project Geologist and Communications Coordinator, Geoscience BC.